Trees are stupid, sticky, and smelly, they break the roads and sidewalks, and drop little pieces of themselves all over my house and car. 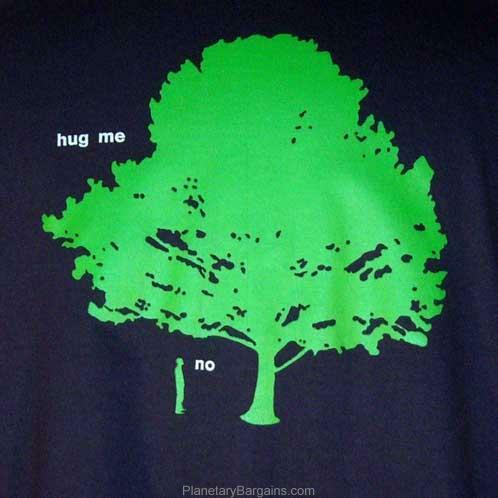 I hate trees. Oh I know the birds like them, but who needs bird poop on their cars, one time I had a bird poop on my head from a tree, and I didn’t like that either, if the tree wasn’t there than there would have been no bird poop on my head that day. Stupid birds in stupid trees, waking me up in the morning and pooping. If birds were civilized they would use the tree to wipe their bottoms like humans do. I really like to cut down trees and burn them, the food I cook on the fire tastes especially good because I know it was cooked with tree. At my work I help turn trees into business reports, which we file away and never read again. This is what trees are for. Everywhere I look today everyone has these cool new iGadgets, they have touch screens, video, music, applications and games. I see advertisements for them on the TV and the Internet, and hear about them on the radio, and I see others with them. I really want one, If I had one of these I would be happy forever. I don’t have a car I wish i had a car, a big one would be nice, maybe a bit stylish looking, slightly pimped up Mercedes. With like some really cool looking mags on it. Right now though all I really need is just one of those super cool touch screen iGadgets. 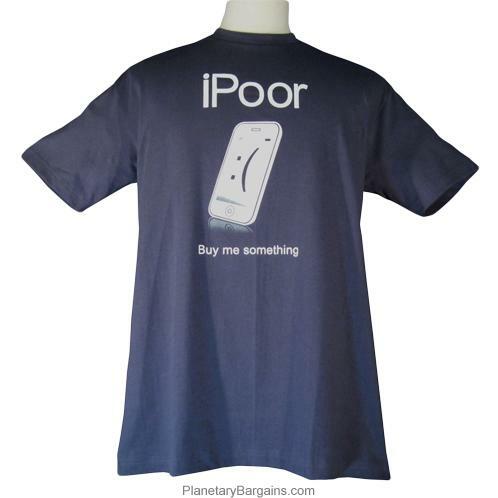 Can you get me an iGadget please? I am not asking for much, just one of those? 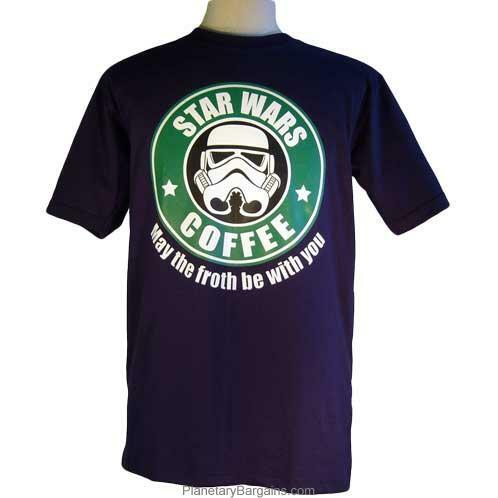 Star Wars Coffee has a reputation for brewing high quality coffee for more than six thousand years. It takes a very special bean and a rigorous process to produce Star Wars Coffee’s consistent high quality brew. Wookie Valdez himself selects and inspects each and every bean from the Forest Moon of Endor’s eastern slopes. Only the very highest quality beans will ever considered for a cup of Star Wars Coffee. Once certified to meet Star Wars quality standards, the fate of the Star Wars Coffee bean is not left to chance. At the shops every detail is carefully orchestrated – including the temperature and amount of water used, the timing and consistency of bean grinding, and the length of time the coffee is brewed. Upon leaving our restaurants, our caring crew, will offer you these kind words of good fortune. Computers can be a frustrating thing, it is very difficult to try and find the origins and solution to the issues your computer will give you over time. However, if you have a problem with your computer at work, now you can get this fail safe guide to solving it. Just follow these simple steps and all of your problems will be a thing of the past. 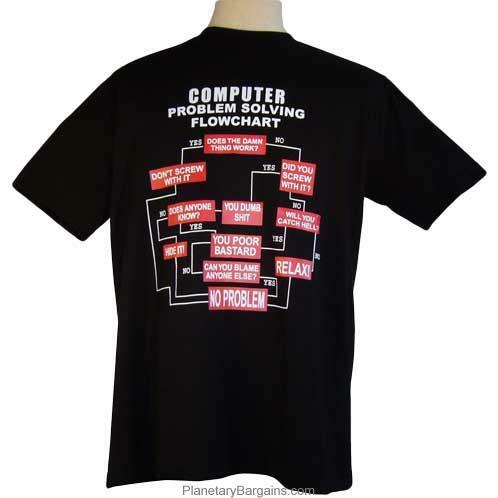 Thankfully this Computer Problem Solving Flowchart comes in the amazingly easy to carry format of being an actual t-shirt, what will they think of next?! However, if you have a problem with your computer at work, now you can get this failsafe guide to solving it. Just follow these simple steps and all of your problems will be a thing of the past. Star Wars was filmed, A long time ago in a galaxy far far away, just like it says it was. Everything in the film really happened. Star Wars was in actual fact, the first known reality series of all time. During the filming of The Empire Strikes Back, while Darth Vader tried to convince his son Luke to join the Dark Side. Darth was said to have used such a convincing argument, that the camera men themselves, as well as one editor decided to go to the Dark Side after hearing it. George later edited the scene out himself due to what he called “a strong influence on the mind”. 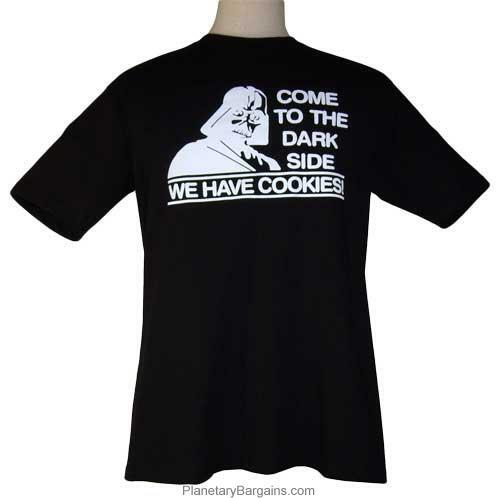 George was not influenced, he already had cookies, so felt no need to join the Dark Side.